Samsung’s latest washing machine includes a built-in sink aimed at providing convenience for users who like to pre-wash their clothes. International CES often serves as a showcase for companies to unveil their latest hi-tech consumer appliances. That was certainly the case for LG and Samsung, which both exhibited a number of products — including mini washers that replace your pedestal, washers with built-in sinks, door-in-door fridges, stoves with lights that mimic gas flames, and robot vacuums. But with all of these connected, cutting-edge advancements, we’d be remiss not to ask, are these appliances really going to benefit the everyday consumer or are they just another gimmick to increase sales? Sure there are obvious advantages to such products, like doing more laundry at one time or not having to haul sopping-wet clothes from one room to the other after a pre-wash, but such appliances also seem more extravagant and probably more costly than a regular consumer would need. “What Samsung does best is focus on how to make consumers lives easier,” Alicia Clark, a representative for the company’s home appliance division tells Consumerist of the company’s latest products. While it could be argued that all of the appliances unveiled by Samsung and LG at this year’s CES make life easier for consumers, there are still a number of questions left unanswered regarding whether or not these products are worth the investment. For instance, why would you need a washing machine with a built-in sink if you have a sink in your laundry room already or why would virtual flames help you when boiling a pot of spaghetti? 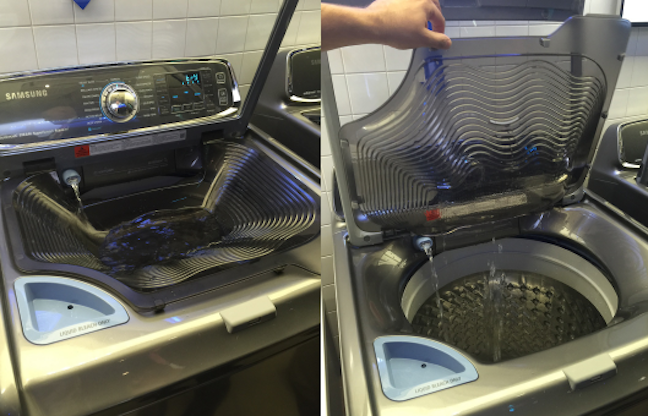 As Consumerist reported earlier this week, the Samsung Activewash aims to make pre-washing clothing easier by incorporating a built-in sink. Clark says the washer targets the nearly 70% of consumers who pre-wash their clothes either in a sink in their utility closets or in the sink of a separate room. Still, the company wasn’t able to provide Consumerist with many details about the new machine, including how much clothing can be pre-washed in the one-cubic foot sink or the cost associated with such perceived convenience. And if previous reports about pre-rinsing dishes translate at all to clothing, pre-washing might actually be a waste of water and time. The Samsung Virtual Flame stove top uses induction heating and LED lights to show the intensity of heat. 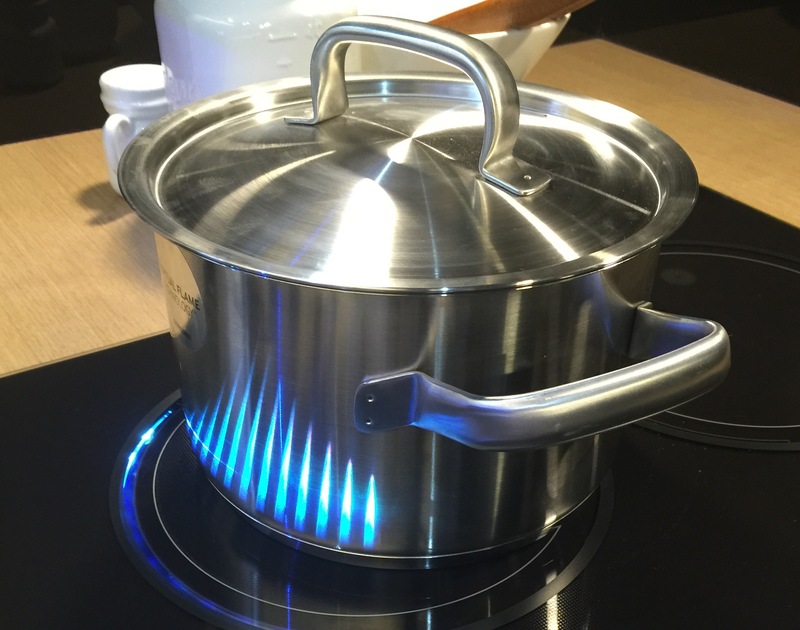 Likewise, the company’s new Slide-In Induction Range with Virtual Flame Technology looks pretty cool when a stainless steel pot is being heated, but can a more novice cook really tell the difference when it comes to cooking? Clark says the stove’s induction top’s LED lighting shows the intensity of the virtual flame increases as you turn up the power. It has nine levels of heat ranging from simmer to boil. She says the product was designed to make induction cooking less intimidating, but is primarily geared toward consumers who like to be adventurous in the kitchen. However, unlike traditional ranges’ the $3,000 Samsung product’s burner sizes must coincide with the size of the pot being used. That means to see the virtual flames, placement is everything and one must use their largest pot only on the largest burner. Another premium-like product introduced by Samsung is meant to give consumers a break from one of the most daunting household tasks: vacuuming. 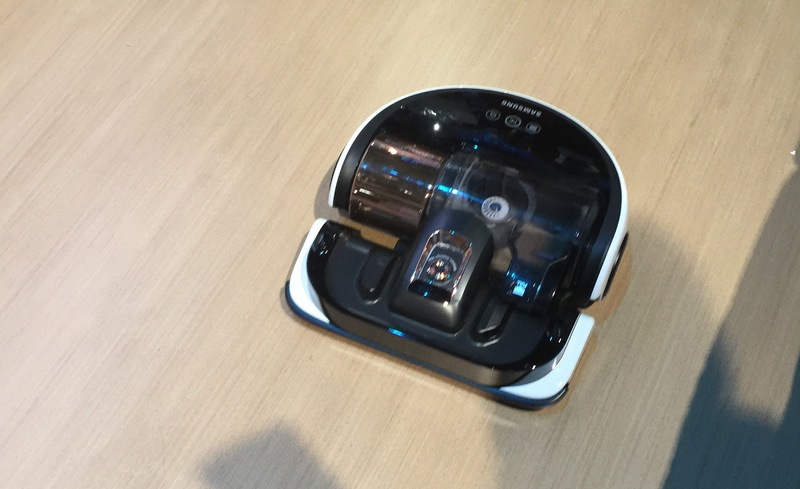 Samsung designed a robotic vacuum, the PowerBot. The Powerbot Vacuum aims to compete with the popularity of Roombas and other robotic vacuum cleaners, Clark says. While consumers can set the device to roam their home, if they want to keep it out of a certain space they must invest and install magnetic strips that block the machine. Clark says both the Activewash and Powerbot appliances are still being finalized, so no pricing information was available. Also at CES, LG unveiled the Twin Wash system, aimed at allowing consumers to wash more clothes at once. The appliance includes a standard front-load washing machine on top and incorporates a mini-washer in an optional pedestal. 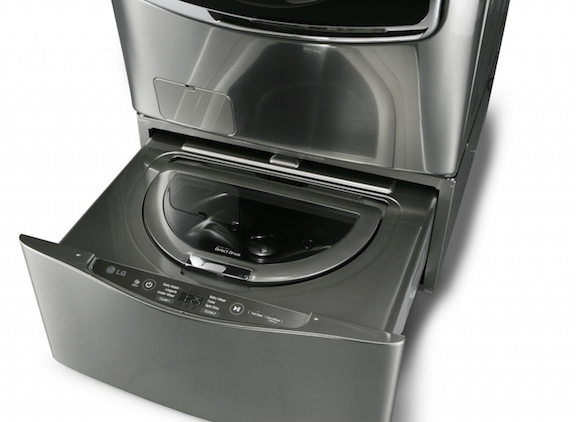 The LG mini-washer takes advantage of the dead space often associated with washing machine pedestals. The company says the currently unpriced mini-washer is perfect for consumers who have a lot of delicates or are conscientious of wash settings. John Taylor, VP of Public Affairs for LG Electronics USA tells Consumerist via email, that the mini-washer holds about four pounds of clothing. “Also it is more economic than larger washing machines currently in use, as it can wash small loads all at once, saving users time and energy,” he says. Still, the company’s assertion that the device saves time by allowing users to do one-and-a-half loads at a time, it doesn’t answer the question of how you dry all of those clothes if you only have one, standard dryer. The LG Door-in-Door refrigerator claims to reduce loss of cold air when opening the doors. The company also focused on its latest door-in-door refrigerator, that allows consumers access their most used food products, like butter, easily without opening the entire door. 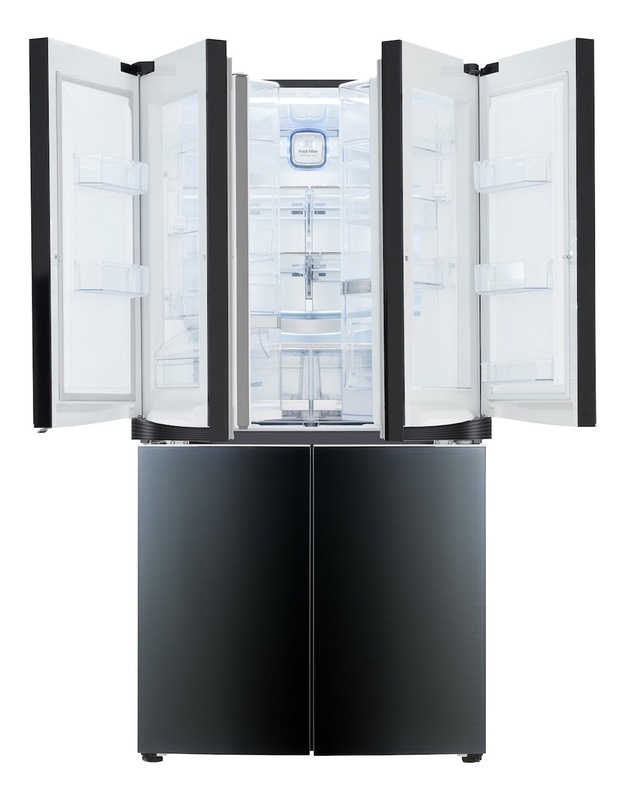 LG touted the Double Door-in-Door Refrigerator as giving consumers the convenience of organization while conserving cool air inside the appliance. Taylor estimates that users can reduce cold air loss by up to 47% by using the door-in-door feature. Instead of focusing on added space or virtual aspects, GE, which didn’t showcase at this year’s CES, took a different route when it comes to new appliance convenience by creating a suite of connected appliances. The company announced this week that designed kitchen appliances, washers, dryers and a water heater that can be controlled by users’ smartphones. The new appliances use a variety of GE apps to allow consumers to monitor their laundry, pre-heat the over from the grocery store and more. GE is clear in its announcement that consumers don’t have to purchase an entire new suite of appliances to take advantage of the smart-connection, but they don’t go into detail about how it will secure consumer data or shield devices from the possibility of hacks by outside entities. Because most of these new appliances aren’t available for consumer purchase just yet, we weren’t able to peg down their costs, but we can only imagine that premium products come with premium prices. Additionally, we were unable to receive information on whether or not such hi-tech products would have an adverse effect on energy-saving initiatives.